I got my license a couple of weeks ago and now my parents feel that it is my job to drive them around while they are working. I've come up with a general list of fun places to take kids over the summer for those of you who are in the same boat as I. Keep in mind that my siblings are eight and ten so this list is catered around that age group. To get fun snacks: During the summer I love to cool off with a snow cone or some frozen yogurt. 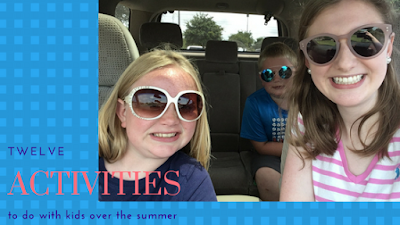 My siblings and I enjoy going to get these treats because they aren't something we have at home and we typically only get them in the summer. It's a fun, easy outing and they are fun to eat while sitting by the pool. To the park: Being cooped up in the house causes my brother and sister to go a little crazy. They start to get bored and then they don't want to listen and they start to argue with each other. The park is perfect because it doesn't cost money and they can run off some of their energy. The movies: On days when is super hot (or raining) we love to go to the movies. The movie theater is always cold and we get to relax while also being out of the house. Although this one is kind of expensive, it makes for a fun, enjoyable day. Swimming: My family recently got a pool put in at our new house. We had one at our old house and didn't realize how much we had missed it until we put one in this year. We love to spend the day in the pool when it's not burning hot outside. Even if you don't have a pool at your house public pools can be a fun place to go. If neither one of those is an option the sprinkler is always fun for younger kids. Making fun snacks: All three of us love to cook and bake so when we have run out of ideas on where to go (or run out of good food to eat) we love to get in the kitchen and make some yummy snacks. Our favorite things to make are slushies, popsicles, and smoothies to cool off. Our favorite baked goods are brownies and cookies. Bowling: We have a bowling alley right down the street from our house and it's a great way to spend the day. We are all absolutely terrible at bowling but we all really enjoy it. The kids are also being active (compared to sitting in a movie or something like that) so they get rid of some energy. At home movie day: My brother's favorite activity to do with me is have a movie day at home. I let him pick out a good movie and we turn off all the lights in the house and I pop popcorn. We have fun popcorn containers and occasionally I will make fun drinks and it feels like we are at the movie theater. It's nice because we can stay in our pajamas and snuggle up with our blankets and pillows on the couch and it doesn't cost money. Lemonade Stand: Last week my sister went to my cousin's house and they set up a lemonade stand and sold lemonade and cupcakes and made a pretty good amount of money. They had a ton of fun while it also kept them occupied all day and they were proud of themselves for making money. Craft Day: In my town there are a few art studios you can go to and paint fun things, or take an art class for the day, make mosaics, and make pottery. We always have an enjoyable day when we go to an art studio because it's an extra special treat and we are all really creative and end the day with something fun to bring home. You can also have an art day at home where you paint or buy one of those craft kits and put it together. Go to a fun restaurant: This is another idea that may be on the pricier side depending on where you live. In our small town there are some restaurants that are fun to go to that don't break the bank. We have an Italian restaurant where kids can make their own pizza and watch it be cooked in a pizza oven. They bring out the dough, cheese, and sauce and whatever toppings they want and when they are ready they can go sit at a bar and watch the pizza cook. Library: Everyone in our family is a big reader so a day at the library is fun for us. My brother and sister get to pick out a few books and a couple of times a week the library has activities going on that they enjoy going to. Amusement parks: Large amusement parks can be pretty hectic but where I live there are a few small ones where you can play mini golf, ride go carts, and play in an arcade. It's a fun activity that doesn't cost a bunch of money and we can spend the whole day there. I have wanted to swim for so long... Great little post!